If you are experiencing tooth sensitivity or if you have noticed that your gums are receding from your teeth, you may be a good candidate for gum grafting. The procedure can improve your comfort, add to the aesthetics of your smile, and preserve the long-term health of your teeth. Gum grafting is one of Dental Restorative Group’s areas of expertise. Our prosthodontists employ advanced techniques and tools that are less invasive than traditional approaches. As a result, Belmont and Greater Boston gum grafting patients benefit from improved comfort and a faster recovery. Beyond the supportive and high-quality care we provide, patients appreciate other benefits of our practice: extended and weekend office hours, highly accessible doctors, three convenient locations, and state-of-the-art equipment. We are also in network with a variety of insurance providers, making the claim submission process simpler and more affordable. Whether you have been referred to our office by another provider or are exploring our services for yourself, we invite you to learn more about Dental Restorative Group and our work. Patients from Belmont and from throughout Boston regularly visit our practice with concerns about receding gums. Causes of recession vary but include gum disease, overly aggressive brushing, and heredity. Gum recession can make eating and drinking painful because of sensitivity. It can also give teeth an elongated and unaesthetic appearance as the tooth root begins to show, and it can raise your risk of bone or tooth loss over time. Our prosthodontists draw donor material from areas of the mouth that other people cannot The grafted tissue is placed carefully so that it looks like a natural part of your gums. The amount of tissue we transfer is extremely small thanks to the micro-grafting techniques we use. Most patients report minimal discomfort and fast recovery. Begin by scheduling a visit with Dental Restorative Group in Belmont or at our other locations. In your initial visit, your prosthodontist will talk with you about the concerns you have, conduct an examination, and identify potential issues. Before we advise gum grafting, we may start with less invasive recommendations. Changing tooth brushing habits can sometimes improve sensitivity and slow the recession process, making gum grafting unnecessary. During the initial consultation, we can demonstrate proper techniques and schedule follow-up visits to re-evaluate the recession’s status. 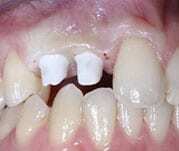 If you require gum grafting, you should know that it is a very common procedure. We use a minimally invasive grafting technique with specialized instruments. Most patients manage discomfort following the procedure with over-the-counter medication. Expect to return at two weeks, four weeks, and three months for follow-up visits so that your doctor can ensure that you have healed properly and achieved the best outcome possible. 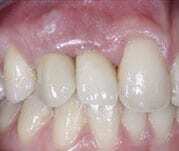 Reduce sensitivity and improve the appearance of recessed gums. 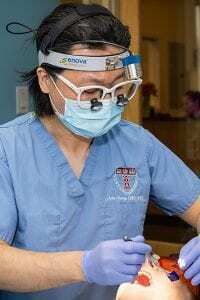 Learn more about gum grafting in Belmont and Greater Boston by scheduling an appointment with Dental Restorative Group.